So, I'll admit it. I've been an avid Doctor Who watcher ever since the latest incarnation of the series was brought back to TV a few years ago (Chris Eccleston & Billie Piper days, for those of you in the know). For those of you who don't know, The Doctor (currently Matt Smith - seen above!) 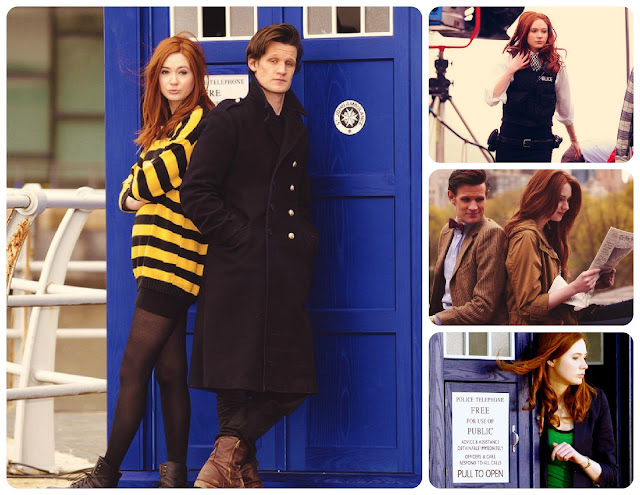 for whom the show is named always travels with a companion (or two) and currently those companions are known as "The Ponds", Amy and Rory to be specific. From her introduction, Amy Pond - played brilliantly by the lovely Karen Gillan - has been one of my all-time favourites on the show. Mastering the art of laid-back cool. The thing about these companions, however, is that they come and go, and with the imminent departure of the Ponds from the show - in tonight's episode no less! - I felt it high time to highlight the style of Mrs. Pond herself, Scottish actress Karen Gillan. She has been so memorable throughout her time on the series, but is becoming increasingly memorable off-screen for her seriously great (and award-winning) style. Personally, I also love seeing a fellow redhead's stylish star on the rise. Loving bold colours and prints! I remember watching youtube footage of the Doctor Who cast's panel at Comic-Con (don't make fun, it was awesome!) and being impressed at the perfect choice of the 3.1 Phillip Lim sweater from the Fall 2012 collection. It really could not have been a better pick for that event. Admittedly, if it were me I MAY have worn it with a little black skirt instead of as a dress. But then again, I'm not a former model - Ms. Gillan is. And some pretty fantastic dresses (My favourite is second from right). I am definitely always inspired most by people who aren't afraid to experiment with their style, and I think that's the thing that I admire most about Karen Gillan. Her look changes so often, and she's not afraid to try a variety of trends, colours, prints - you name it! She obviously has so much fun with her sartorial choices, and with (literally) winning results. In addition to her status as one of my favourite Doctor Who companions, she's also high on my list of current style inspirations. Especially after a recent role as one of the world's first supermodels, the iconic Jean Shrimpton, I look forward to seeing how her style evolves. Most especially to see if she will pick up any hints of the famously fashionable woman who inspired the role. If you're also a fan of Karen's style, you may want to check out this tumblr, which does a pretty spectacular job of documenting it! P.S. If you, like me, will be watching "Angels in Manhattan" this evening, I'd love to hear your thoughts! Love a good Who debrief! I'm with you, Amy and Rory will be deeply missed! I did enjoy Amy's style choices throughout the show... so much more than than Rose's (sorry, hoodies just don't do it for me) and she had a lot more flare for style than Martha or Donna. I almost don't want to watch tonight. I know I'm just gonna bawl my eyes out. Love her style. She totally rocks the red hair! She has fabulous style! I really love when a person has fun with their looks and changes it up all the time!